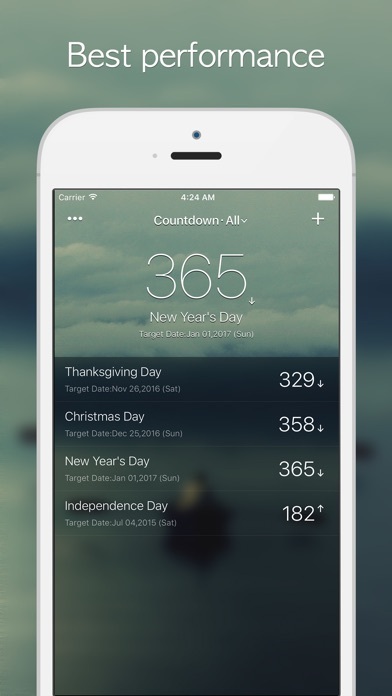 “Countdown” is an app to remind you with your important schedules and events everyday. 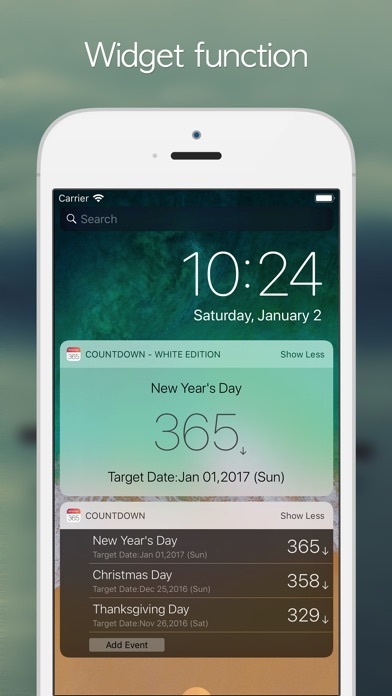 This is best countdown app available in the AppStore and is optimized for iOS12, with blur effects, vector images, and various features. Basic Functions: 1. Sort your events 2. Share your events 7. Custom categories 5. Repeat event cycles 4. Customize reminders 6. Main daily event alerts 3. Customize date settings 8. Display completion events on the icon. Special Functions: 1. iCloud backup 2. Date calculator (Swipe left from the main screen) 3. Use as a widget 4. Custom themes 5. Supports 3D Touch 6. Unlock using Touch ID 7. Pattern lock protection 8. Past event notifications 9. Lunar calendar settings (available only for Chinese Version) 10. Changeable date format (300 or 9M 25D) 11. 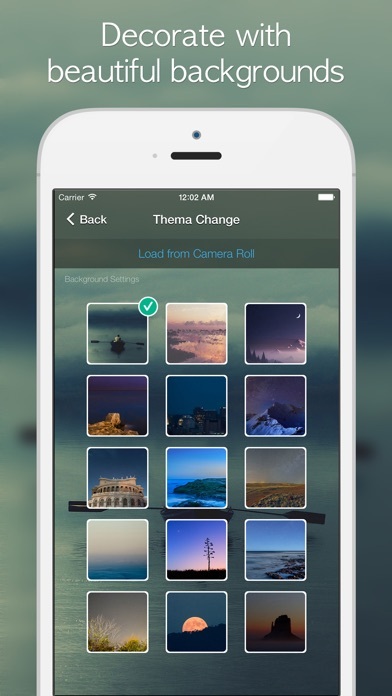 Supports widget themes 12. Custom background images 13. One day pass the target function. 14. iOS calendar events import and export. Kind of confusing with all the countdown breakdowns . Would be better if just had total countdown and that’s it . It’s a great app just wish there was more of a description area or a notes space so i could put locations or addresses. I downloaded it and put in all my events and it worked fine, then I put a password on it and I can’t open it or anything all it does is close right out. It gives you the exact date and everything, it helps me keep tracks of the important dates !! Great app! The only thing I would change is to make it so that each event can have its own picture background. Allows for multiple events. You can change the background picture. I don’t have the need to share events so the free version works for me. I love this app. It has gorgeous themes and is super useful. The only thing I hate is that it doesn’t change with daylight savings. Great app. Simple and works. Does what it says, though was off by one day until March 1st, now accurate...leap issue? No description of what PRO (paid) version brings. appears no sync between iPad and iPhone (using same appleID)-weak Do not see way to change font or other display settings. 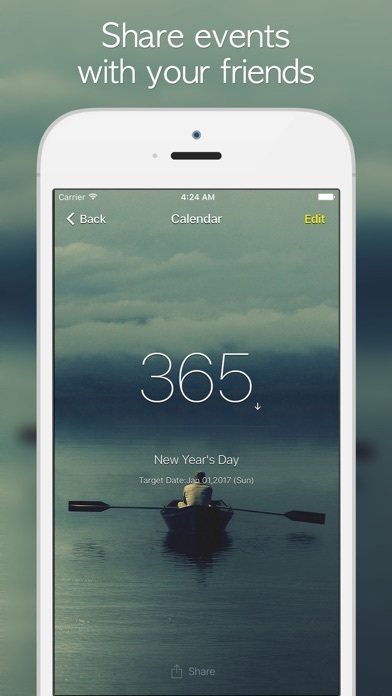 I like this simplicity of this app but my countdown is off by one day. So if I have “70 days until __” I have to remember it’s really 71 days until then. This is so god for me. As and busy adult with tons to remember this app keeps me on time and up to date. the app overall is great, i love the look of it all but the day is off by ONE day. it’s okay but annoying at the same time. I can’t even open the app. It’s very aesthetically pleasing but everything is off by a day?? I like this app very much! It takes a bit of effort front loading the dates but after you’ve got them all in there, the reminders are so helpful. I’d like to see the option to repeat bi-weekly, please! I add paychecks in to the countdown and need to add each one instead of just repeating. This app helps me keep track of all the important events in my life. It counts both days since and days to an event. Perfect for long term planning. I love this! It is so amazing best app I've ever used. It's fast accurate and neat! I’ve been using this app for a couple of years now... it’s GREAT! It does what it says! 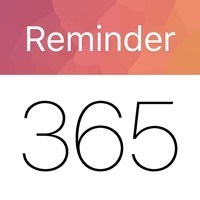 Counts down to a holiday, countdowns to birthdays and any number of other important events. Love it and you will too! Thoroughly recommended! I love the app’s design, but I wish that you could choose to display the remaining time as weeks / days / hours instead of just days. It would be great if it could send out automatic emails. This is a pretty useful app to keep an eye on an upcoming deadline, however I would like a little section where you could write down the details of that particular deadline or event so you could quickly look at the date with a little reminder of what all is to be completed on that particular date. Keeps all dates and events available at a glance. Very useful and helpful app! I can’t believe it but I’m counting down to my 1st grandbaby! Working great. Now I just have to get over the shock. Nothing fancy. Does what it is supposed to do. Wish the days until and days from we’re more identifiable than just an up down arrow. Elegant background and easy to use. Works fir multiple dates. Great countdown app. Does what it says and the themes are nice! As what I said above. The font in the app is really ugly. Other things are good. Simple. Does its job as promised. Love the app. Can easily add and remove events and can also set it for yearly recurrences like birthdays. Would like to see option to change font size but regardless, the app is great.